AS OF NOVEMBER 21, 2012, IT WAS REPORTED THAT THIS PLACE HAS CLOSED. En Route’s love for burgers, steaks and all fried and grilled comfort food was never a secret. It has become its own sub-journey to find some of the best burger shops. And like the most recent entry on burgers, it is in the small shops that can lead you to find some of the tastiest burgers in town. 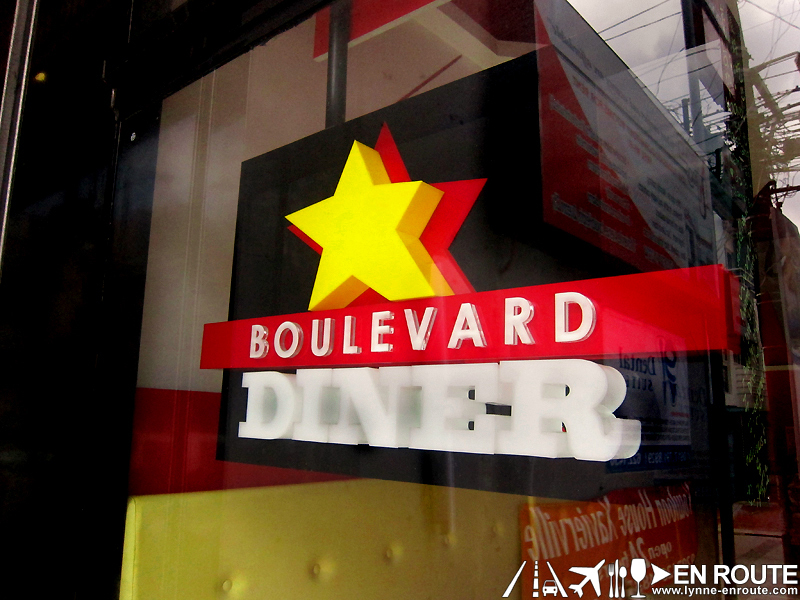 Boulevard Diner has been on the sights since the beginning of the year. 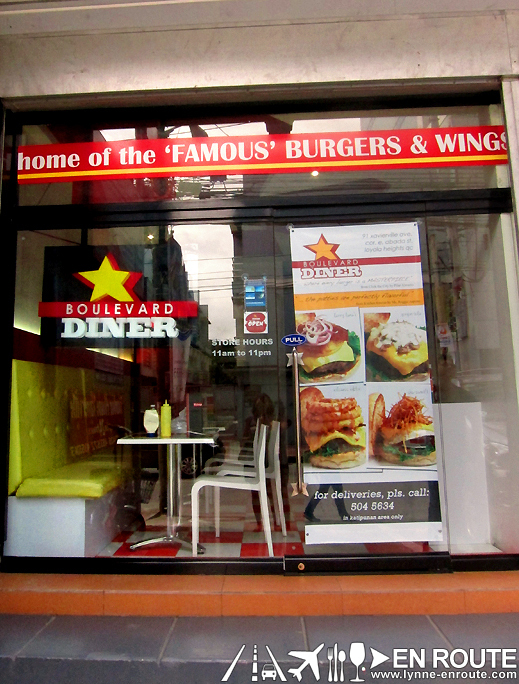 However, the roads En Route has travelled have rarely led to the Katipunan area where Boulevard Diner currently sits. And with a small detour, En Route finds itself traversing this street to finally take the taste buds into a road of flavors. Boulevard Diner pays tribute to the era of American diners along main streets where teens gather up after class to have their order of burger, milk shakes and root beer floats. While not as ostentatious looking as Mr. Jones, the vibe is not sacrificed. 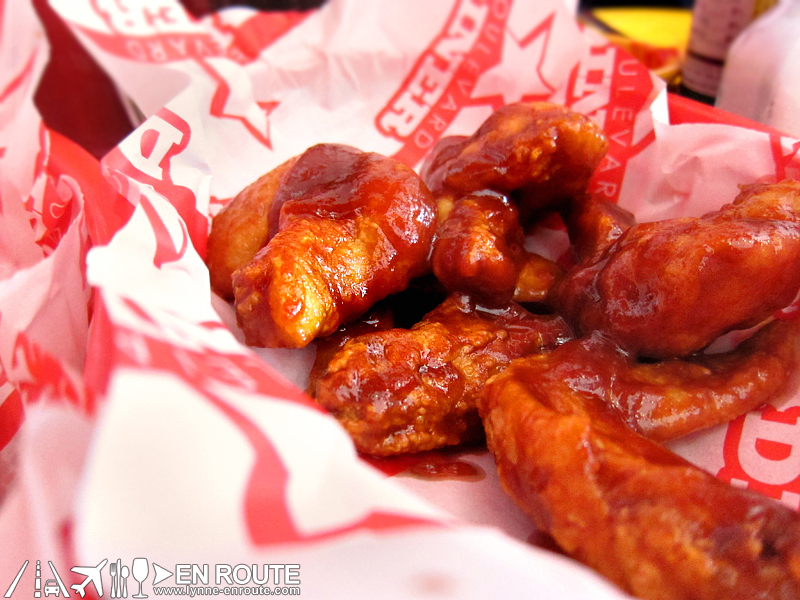 It is bright, lively, and prepares you for what they do best: burgers, wings and spuds. So what would a hapless hungry wanderer do? Order a bit of each, of course 😀 ! Click for a full-sized version and check out the goodies! The menu has an extensive selection with slight variations to suit your fancy. Some will have your basic burger toppings while there are options for interesting combinations. Ever wondered how pineapple or peanut butter would taste in a juicy beef patty? Come on over to Boulevard Diner and let us know how it tastes. The burger patty, however, remains the true test of the burger, so their basic burger with cheese was the benchmark. 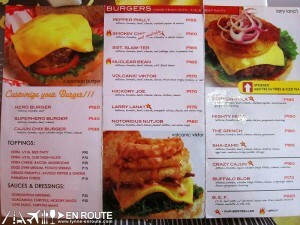 The Superhero Burger (PHP 140.00 with tomatoes, lettuce and cheese) was one of the best tasting burgers ever experienced. The bun was firm, vegetables were fresh, and the beef patty was oozing with juiciness that it is hard to imagine that it is just seasoned with plain salt and pepper. The reality is that the simplest is sometimes the best. To pay tribute to American tradition of ordering a milk shake with the burger, that’s what came next. 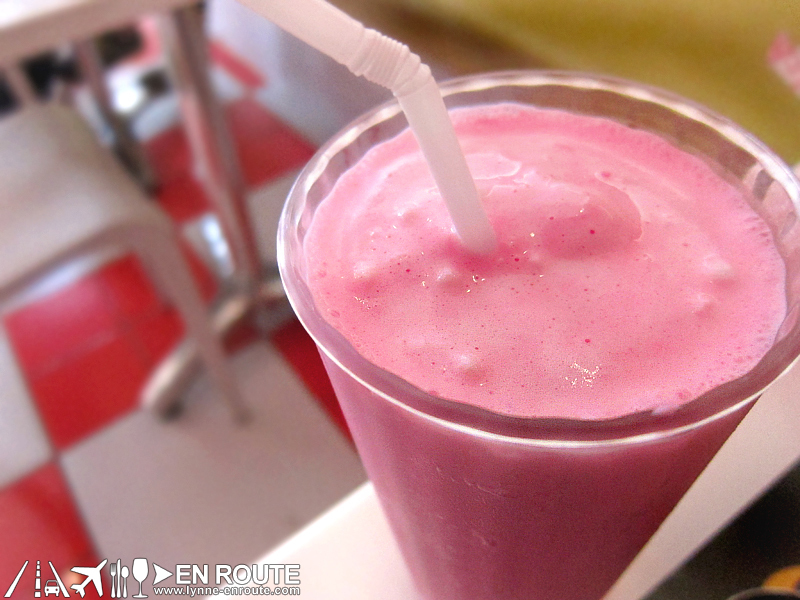 The surprise of your lives will become apparent: Boulevard Diner also whips up some of the thickest and creamiest milk shakes in the metro. 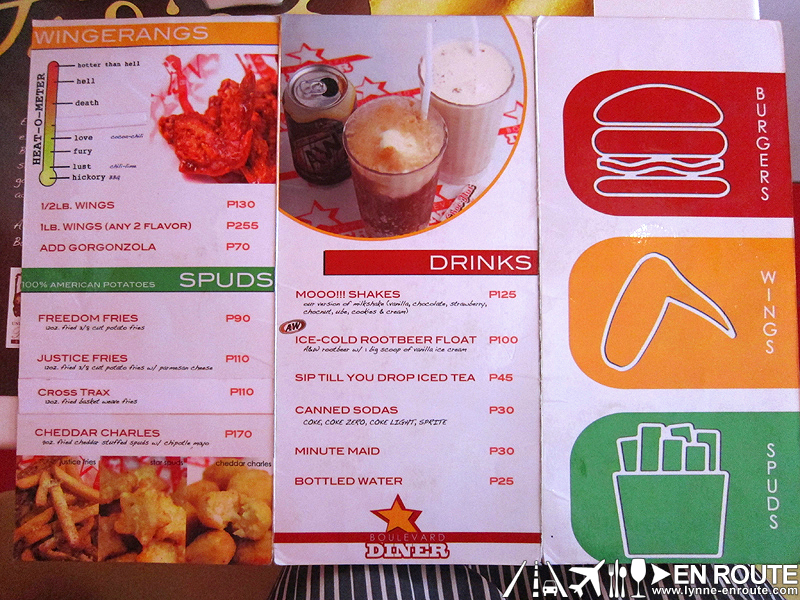 Milk Shakes are about PHP 125.00 for a glass. You can even see what goes in it since they prepare it on the side: ice cream, milk, ice. That’s pretty much it. But the proportions were just so well thought of, the balance of creaminess and sweetness was a compliment to the delicious burger. Try it in different flavors! Boulevard Diner also boasts of buffalo wings and spuds, so this trip has to sample at least one of each! 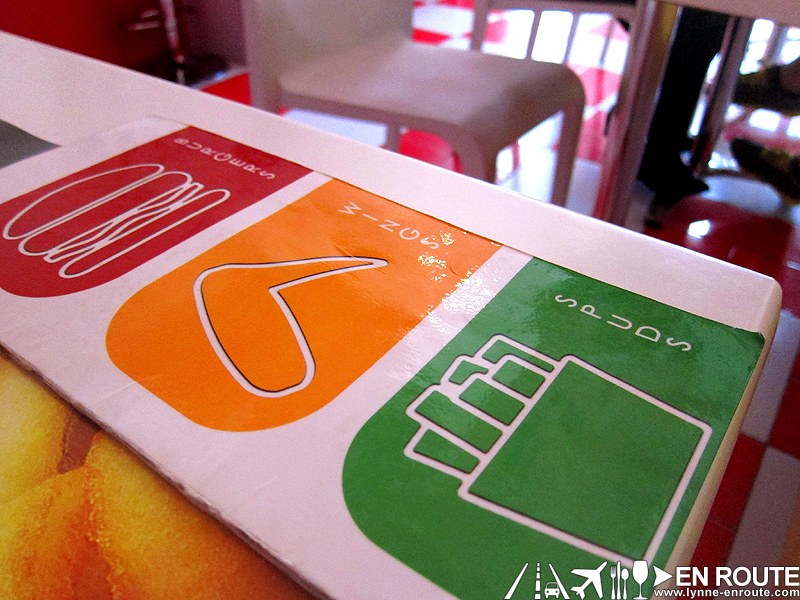 Get your wings in your preferred intensity (PHP 130.00 for half a pound). The Heat-O-Meter will help you decide. One variation called “Love” draws attention since it has chocolate flavoring in it. It is an interesting combination for the adventurous. As for spuds, it has got to be their Cheddar Charles (PHP 170.00). Basically potato balls with cheese. 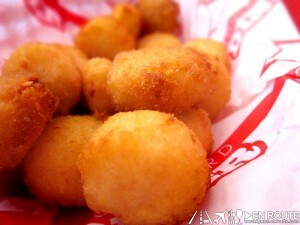 Crunchy on the outside, soft on the inside, cheesiness all over. What it does say, however, is that a great number of foodies have found their way into Boulevard Diner, leaving with a great deal of satisfaction. 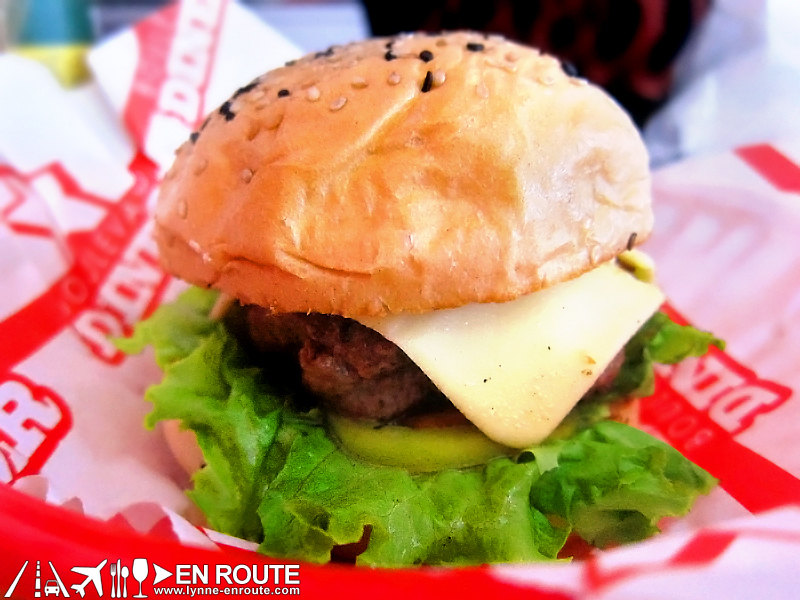 It’s about high time everyone heads this route for some of the best burgers Metro Manila has to offer. 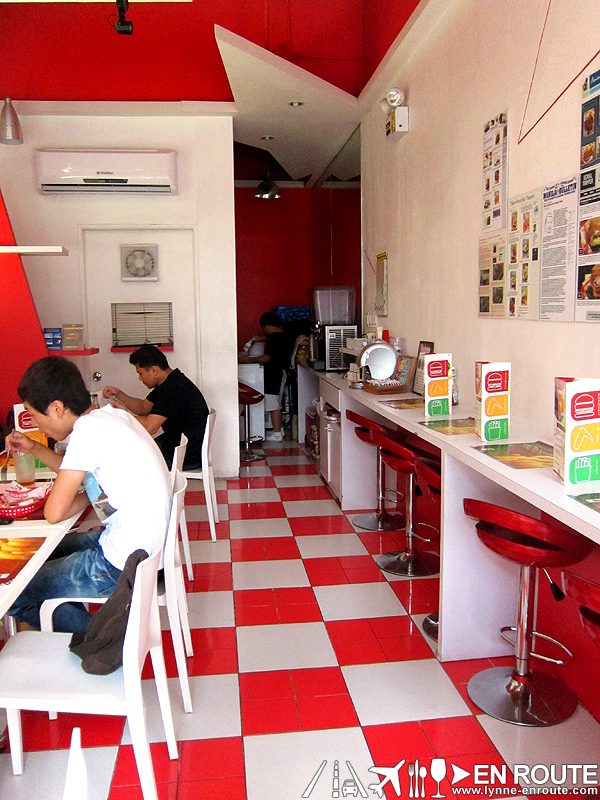 Boulevard Diner is located at 91 Xavierville Avenue, Loyola Heights, Quezon City, Philippines (from Esteban Abada, take a right and it will be 50-80 meters on your right). Telephone Nos. +632-504-5634. 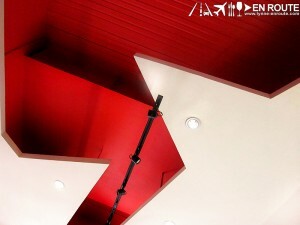 Email at 888dinerconcepts@gmail.com / alvinong.84@gmail.com or visit their Facebook Page Here. 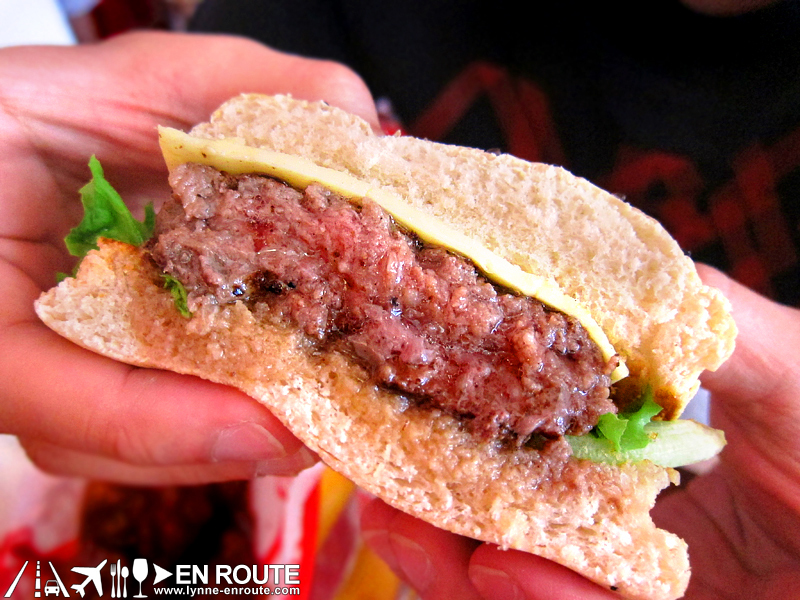 Fan of burgers or have tried some of the other burgers in Boulevard Diner? Hit up a comment in the below to share it in Facebook! I’m not a big fan of burgers, but this post made me crave for some! That burger looks yummy and the milkshake is so thick and rich even on the photo. 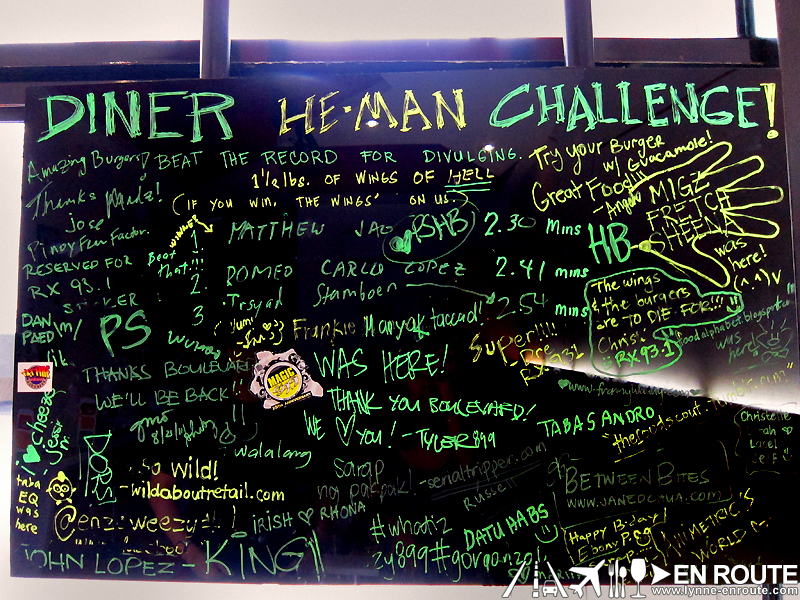 Would love to try this some time soon, although I rarely pass by Katipunan. It’s the best burger I’ve had in my life! I do not exaggerate. I wanna try this soon! Any news if they have (or will have) branches near the south? Not sure if you will get to try it soon since it is already closed. We are not sure if it opened in a new place. Oh no! they closed. 🙁 i hope they relocate to more accessible place. i keep hearing a lot of good reviews about their burgers and would like to try them.